Street sizing––one of the pre-looming processes was identified where significant improvement was required. The process mainly involves a continuous coating on a warp sheet with starch paste. This is achieved with a handheld spray and heavy brush. The objective of the sizing process is to strengthen the yarn which needs to go through the cyclic forces during the process of weaving. Sizing process is a key pre-looming process as poor sizing drastically increase the rate and number of yarn breakages. However, due to the drudgery of sizing operation and low income, many sizers have been deserting their professions. Our research proposed four mechanical designs to aid in the street sizing process. The designs were helical, circular, hexagonal and modified hexagonal with an off brush system. The group tried several prototypes and a scaled model was installed at Chirala. Trials are now being undertaken by local sizers. Several iterations have been done to the first prototype, keeping in mind the sizers’ feedback and the activity of product development is under progress. 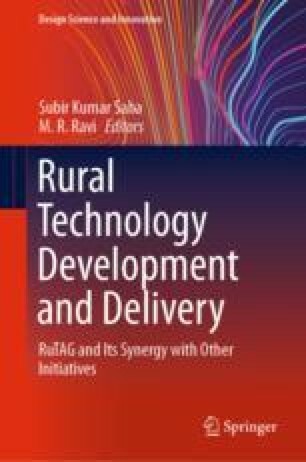 The authors wish to acknowledge the funding from Design and Innovation Translational Seed Grant, MHRD, Government of India. The researchers would also like to thank Mr. M. Mohan Rao and all the other members of Rashtriya Chenetha Jana Samakhya, Chirala for bringing forward this project and for providing all sort of support throughout the project. They have not only provided all the necessary information about various handloom processes but also arranged the authors’ stay in Chirala for research purposes several times. All the help from their side is greatly appreciated.